Grammy Award-winning singer/songwriter, actor and author Ashanti is a native of Glen Cove, Long Island. Ashanti burst onto the music scene with her 2002 smash hit, self-titled debut album “Ashanti.” It landed the #1 spot on both the Billboard Top 200 and R&B album charts, selling a whopping 504,593 units in its first week. Her first week showing set a SoundScan record as the most albums sold by any debut female artist in the chart’s history, granting her a spot on Guinness World Records. With her hit song, “Foolish,” Ashanti also secured the #1 top spot on SIX Billboard charts simultaneously, including Hot R&B/ Hip-Hop Airplay, The Billboard 200, Hot R&B/Hip-Hop Singles and Tracks, Hot 100 Airplay, Top R&B/Hip-Hop Albums and Hot 100! “Foolish” stayed on the Billboard charts for 11 consecutive weeks. She made Billboard history by having her first three chart entries land in the top 10 of the Billboard Hot 100 at the same time. She is the first female to accomplish this feat, previously only attained by the Beatles.That year she was awarded 8 Billboard awards. Her album “Ashanti” topped the Billboard Album Chart and also won the Grammy for Best Contemporary R&B Album. In addition, that year she won 2 American Music Awards and the Soul Train Aretha Franklin Entertainer of the Year Award. Her follow-up release, “Chapter II,” debuted in the number 1 slot for two consecutive weeks on the Billboard Album Chart and spawned two Top 10 singles. In addition to her Grammy, she’s also received multiple Soul Train Awards, a MOBO (Music of Black Origin) Award, a Comet Award (Grammy Equivalent in Germany), Lady of Soul Awards, a Teen Choice Award and Nickelodeon’s Kid Choice Award, along with many other nominations including an MTV movie award nomination and an NAACP Image Award Nomination for her role as Kera in “Coach Carter.”Ashanti’s other albums include “Ashanti’s Christmas,” “Concrete Rose,” a remix album titled, “Collectibles by Ashanti” and “The Declaration,” which she Executive Produced. It was around the time of “The Declaration,” that Ashanti created her own company and label, Written Entertainment. The album was the first release on Written Entertainment, and it was distributed by Universal. Ashanti is the CEO of the company and the first artist on the label. Since its inception, Ashanti has released numerous projects on the label. “The Declaration” featured producers and artists Babyface, LT Hutton, Diane Warren, Nelly, Jermaine Dupri, Pharell, Robin Thicke, Brian Cox, and Neffu to name a few. 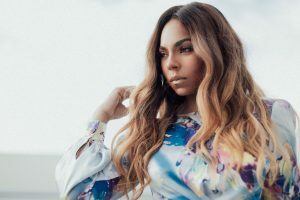 The first single off of “The Declaration,” “The Way That I Love You” won the Music Choice Video of the Year Award in 2009.Ashanti’s forthcoming album, the highly-anticipated “Braveheart” will be released this summer on Written Entertainment and distributed by eOne Music. The album features the heart-wrenching single, “Never Should Have.” “Braveheart” also included the tracks “The Woman You Love” featuring Busta Rhymes and “That’s What We Do” featuring R. Kelly. Ashanti made her directorial debut for her video “The Woman You Love.” All three tracks are currently available on iTunes. She is certainly considered a mogul in this business! Ashanti currently has a lead role as LaTasha Montclair in the #1 Lifetime television series Army Wives, produced by ABC. The current season premiered in March. She made her telefilm debut starring in The Muppets’ Wizard of Oz, opposite Miss Piggy and Kermit. She also starred in the Disney animated series The Proud Family. She got her start in acting on Buffy the Vampire Slayer, Sabrina, the Teenage Witch, and portrayed Dionne Warwick on American Dreams. She has also played herself and performed on the hit TV series Vegas. She appeared as the special guest for the successful ABC ‘s Extreme Makeover Home Edition and was a special guest performer on NBC’s The Biggest Loser, as well. In her feature film debut Coach Carter, she co-starred with Samuel L. Jackson in the #1 box office hit (MTV/Paramount). Ashanti’s other films include yet another #1 box office hit, Resident Evil Extinction, where she starred as “Nurse Betty” opposite Milla Jovovich (Sony Screen Gems). Previously, she starred in the hugely successful John Tucker Must Die (Twentieth Century Fox) alongside Jessie Metcalfe. She can be seen as an Indian songstress who sings in Hindi and English as she dances in the Bollywood film Bride & Prejudice with Aishwarya Rai (Miramax/Casablanca). Ashanti recently wrote the title track for the film Dream House, produced by Morgan Creek and starring Daniel Craig. The track it titled “Never Too Far Away,” and was released on September 30, 2011 on her label Written Entertainment. She will also write the score and contributed to the soundtrack of the new film Tupac, slated for release in Fall 2014 and also produced by Morgan Creek. She has written her first book of poetry through Hyperion titled Foolish/Unfoolish: Reflections on Love which is currently in its eighth edition and is also an Audio Book/Spoken Word. Ashanti made her theatre and stage debut with the starring role as Dorothy in the Tony Award-winning Broadway adaption of The Wiz. She also participated in the 5th Anniversary of the Broadway smash Wicked, alongside Joy Behar and sang “Defying Gravity.” She was a part of the 70th Anniversary of the Classic Wizard of OZ at Tavern on the Green where she sang the Judy Garland version of “Somewhere Over the Rainbow.” She released her version of the song in iTunes, again under her label Written Entertainment. Ashanti is an entrepreneur! She has her own fragrance, “Precious Jewel,” sold at Wal-Mart and other fine stores, as well as a dietary supplement vitamin called “Ashanti’s OPC-3 Beauty Blend”.Her endorsements include: Herbal Essences, where she is the first African American to land a national campaign, Candies Apparel, as well as MUDD Jeans’ line “Delicious Curves” and Johnson & Johnson’s Body Care.Ashanti has performed before Presidents and royalty. She has performed duets with the likes of Pattie Labelle, Smokey Robinson, Ronald Isley, Stevie Wonder and Kenny Chesney to name a few. She has appeared on shows ranging from The Oprah Winfrey Show, The Today Show, Ellen, The Tonight Show with Jay Leno, The Late Show with David Letterman, Live With Regis & Kelly, Live With Kelly and Michael, Saturday Night Live, The View, The Rachael Ray Show, Jimmy Kimmel Live, Late Night with Conan O’Brien, E!’s Chelsea Lately, BET’s 106 & Park, MTV’s TRL, VH1’s Hip Hop Honors and Fuse TV among others. She has performed on virtually every music awards show from the Grammys to the American Music Awards, the MTV Video Music Awards, MTV Europe Awards, VMAs Japan, The BET Awards, The World Music Awards, The Much Music Awards, the Soul Train Awards, Teen Choice Awards and the Nickelodeon Kids’ Choice Awards. She is an American favorite, singing the National Anthem and “God Bless America” for major events, including the World Series and the NBA Finals Play off Series, as well as performing for the NBA All Star Game.She Executive Produced her first television special on ABC Family in 2004. Ashanti has recently partnered with Warren Miller to Executive Produce and shoot a pilot for a docudrama. In 2012, she was also an Executive Producer of “Fuse News,” on FUSE TV, the national music television network of The Madison Square Garden Company, which debuted in February 2013. She continues to reign at the top as one of Billboard’s Top Females of the Decade from 2000-2010. She is currently on the list of The Twenty Best Selling Music Singles for her single “Foolish,” which has sold 8.2 million copies to date. With all of this amazing success, Ashanti has never lost sight of who she is and how important it is to give back to the community. She has been very active supporting a large list of charities and good causes. Ashanti is the Ambassador for the Jumpstart reading program and also is a Chain of Confidence Counselor for the Tupperware Brand. She became the Youth of the Year Ambassador for the Boys and Girls Club of America in 2009 and was inducted into their Hall of Fame. She became a member of their “BE GREAT” Campaign with Denzel Washington, with whom she shot a National PSA on education. It debuted at the Congressional Breakfast in September 2011. The PSA was directed by Oscar Winner Ron Howard. Look for this independent young lady to conquer the world in 2017 and the future!